I wanted a snake, but I didn't want to take the time to buy one. Craigs List provided an easy solution: call, make an offer, ball python delivered. Snake people even carried the tank in. They went over its care, saying it needed two mice-not to pet, to eat. Off we, my daughter and I, go to the store. Pet store guy asks if I want to pick out the mice. I declined. 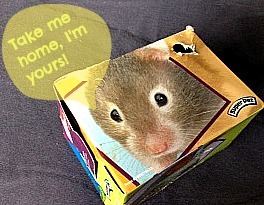 He hands me a cardboard box that says "travel safely with your new pet". Feeling guilty, we put the box on the back seat and stop at the grocery store. When we come back, the box is empty. The mice nibbled their way to freedom...in my new car. Will the mice nibble at the wires for revenge? Will they attack my achilles heal when I'm on the freeway? Will the store provide free mice for having such stupid boxes?